Help Hazel to renovate a Living Room, Bedroom, Study and Dining Room with real world furniture! Help Hazel decorate gorgeous Living Room, Bedroom, Study and Dining Room for her client with real world furniture! Make money by selling off unused items and completing various minigames (or skip them as you wish!). 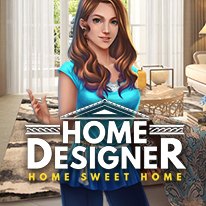 Take inspiration from the game's lifelike design and decorate your own home too! With more than 25 game modes to play and more than 400 furniture options, you'll be spoiled with so many things to do! - Turn 4 drab, empty rooms into fabulous Living Room, Bedroom, Study and Dining Room! - With more than 400 furniture items, you have a lot of design choices for your rooms! - The game offers more than 25 game modes for maximum fun and excitement! - Play fun games, decorate lifelike rooms while learning something new everyday by reading the game's fun facts!